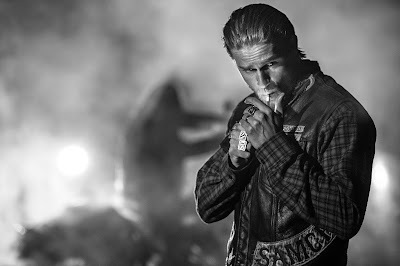 If the first few episodes of Sons of Anarchy's final season are any indication, then the series is going down in the same manner it started: as a tragedy of Shakespearean proportions, with the eponymous motorcycle club's royal family and their dysfunctional dynamics at the heart of what ails its crown prince. Jax (Charlie Hunnam) is as dark and vengeful this season as he was bright and optimistic just before his wife Tara's shocking demise. SAMCRO is licking their wounds while preparing to once again make their ascendance in their town of Charming. And Jax's mother, Gemma (Katey Sagal), is alternately remorseful and gratified that sacrificing Tara allowed her to preserve the strength of her two fractured families: Jax and his young sons and the motorcycle club.